Balzer + Bray, 9780062201812, 400pp. 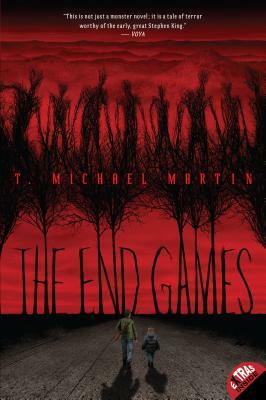 John Green meets Stephen King in this original take on the zombie apocalypse by author T. Michael Martin, which ALA Booklist called "the best of the undead bunch" in a starred review. Seventeen-year-old Michael and his five-year-old brother, Patrick, have been battling monsters in the Game for weeks. In the rural mountains of West Virginia—armed with only their rifle and their love for each other—the brothers follow Instructions from the mysterious Game Master. They spend their days searching for survivors, their nights fighting endless hordes of "Bellows"—creatures that roam the dark, roaring for flesh. And at this Game, Michael and Patrick are very good. But the Game is changing. The Bellows are evolving. The Game Master is leading Michael and Patrick to other survivors—survivors who don't play by the rules. And the brothers will never be the same. T. Michael Martin is a novelist and vlogger who holds a BFA in filmmaking from the University of North Carolina School of the Arts. He and his wife, Sarah, live in Indianapolis.